Trinity Claddagh, New Puff Heart! Our Products >> PROTECTION SYMBOLS >> Trinity Claddagh, New Puff Heart! 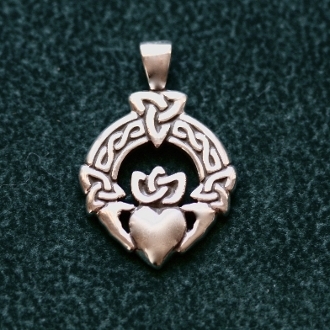 The Trinity Claddagh pendant here is nearly an inch in diameter, (approx 22mm) and althogh medium in size, has a bold look with strong engraved linework and unique presence. This newly crafted version includes the heart portion dimentinalized which I call "Puff Heart" I have 2 other versions, one of which is a charm size, and the original version as a flat engraving which is the same size as this new style.